Happy Earth Month! I love April for so many reasons and fresh flowers, sunshine and Earth Day sure are a few! Ever since I started this blog over 5 years ago, I have brought attention to many Earth-friendly products and companies. Yes, April is National Earth Month but every day in my home is Earth Day. 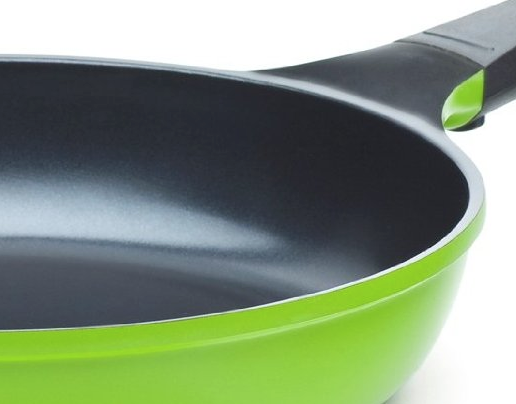 A few months ago, I received an Ozeri Green Earth Frying Pan for review. In all honesty, they're probably not happy that it took me so long to test the pan out and give it a fair review. I detest bloggers that don't do enough of that. I have used "green pans" before and they chip, stick and get nasty after a few weeks/months of use. I wanted to make sure that YOU were told the truth about Ozeri and their pans. First off, I used this pan, at least once a day for the last 4 months. Thats over 100+ times of cooking, washing, drying and repeating. I always wash and dry it right away and hang it on the wall in my kitchen so it won't scratch. Another thing you should know is that THIS PAN IS MAGIC!! Let's get to that! The second picture illustrates how clean an omelet flips out of the pan! This is where other pans frustrate me. I was blown away from day one. The third picture also illustrates how amazing the nonstick coating is on the pan. I was making a frittata and all I did was clear a little section of egg off with a spatula. It was effortless! The last picture, the grilled cheese demonstrates how EVEN everything cooks in this pan. Its still mind-blowing even after so much use. Pretty much what this means is that the nonstick coating that Ozeri utilizes is nontoxic and won't compromise your food or your health! That is not only revolutionary but it is admirable and noteworthy! I have absolutely zero complaints about this pan. I love everything about it. In fact, my husband, who is a chef, said "this is by far the best pan I have ever used". Now, that is a heavy compliment! Purchase yours today on Amazon and get free shipping on orders over $35. Putting this on my Christmas list!